Fall of 2013 has been quiet for wheat diseases with no wheat samples coming into the Diagnostic Lab. Otherwise, the only report of a wheat disease in the state has been a report I received from Brian Vincent who indicated that Keith Castner (BASF) had observed leaf rust in late October on early planted ‘Duster’ near El Reno, OK. This finding is not surprising as leaf rust often is observed in Oklahoma in the fall. Fall leaf rust rarely warrants fungicide application. Cold weather and/or grazing help remove the rust pustules. Fall infestations should be monitored, however, and control measures might be considered if the problem remains after jointing in the spring. When leaf rust is observed in the fall, the value of spraying to control that rust is asked. Fall-infected leaf rust plants typically have yellowed lower/older leaves with rust pustules, but the youngest 2 or 3 leaves are green and healthy. As temperature drops through November and December, the older rust-infected leaves die and new infections are greatly slowed and inhibited. Grazing also helps to remove these leaves and increase air circulation and drying that are conditions less favorable to spread of the disease. Given these consideration, spraying to control leaf rust in the fall is of limited value. The primary concern with fall infections of leaf rust is that with a mild winter and sufficient moisture, the rust will survive through the winter and inoculum will be present in fields to start the disease early in the spring. Hence, monitoring of these fields through the winter and early next spring is recommended to see if application of a fungicide to control the rust is indicated in the early spring. I called around to other extension specialists [northwestern OK/panhandle (Rick Kochenower; Area Research & Extension Specialist – Agronomy), south central OK (Mark Gregory Area Extension Agronomy Specialist), and southwestern OK (Gary Strickland; Extension Educator – Jackson County), and all indicated that no foliar or root diseases have been observed to date. Kansas (Dr. Erick De Wolf, Extension Plant Pathologist, Kansas State University): Leaf rust was found in research plots near Manhattan KS (Northeast Kansas) on Oct 25. Dr. Bill Bockus reported leaf rust in research plots that were established approximately a month ago (about 2 weeks before the normal planting date), and have ample fall growth. The leaf rust was observed in multiple foci or “hot spots” but was now present at low levels throughout the plots suggesting the disease has been there for more than 3 weeks. The incidence was approximately 2-5% with severity of trace to 10% on any given leaf. 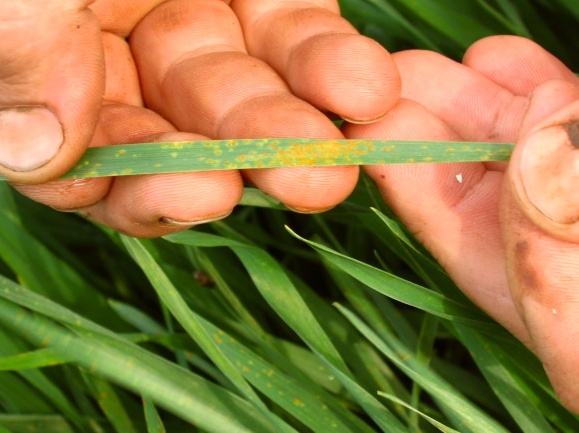 The leaf rust was found on the wheat variety 1863. This variety is known to be susceptible to leaf rust. An older variety Newton was also infected. It is not unusual to find leaf rust near Manhattan this time of year. The winter conditions are often enough to keep the rust population from overwintering in KS, but finding the disease in the fall could be important if we have a mild winter. It has been several years since leaf rust observed in the fall at this location. The absence of rust in these years was likely related to the drought that dominated the central plains in 2011-2012. The drought conditions have lessened in recent months and leaf rust is returning to normal fall activity. We will be monitoring this location and others to check for overwintering leaf rust.